A powerful winter storm is expected to arrive in Southern California by Thursday evening, packing the potential for heavy downpours, flash flooding and mudflows. The cold weather system was moving through Northern California early Thursday, bringing heavy snowfall to the Sierra Nevada Mountains. Powerful winds and torrential rains slammed lower elevations. Widespread showers are in the forecast for the southern end of the state, which could mean flash flooding near wildfire burn scars. The storm was expected to reach Southern California late Thursday and into the early hours of Friday. Rainfall is expected to hit Southern California by this evening through Saturday, which is creating concern for burn scar areas. Shanna Mendiola has your First Alert Forecast for Thursday, March 1, 2018. 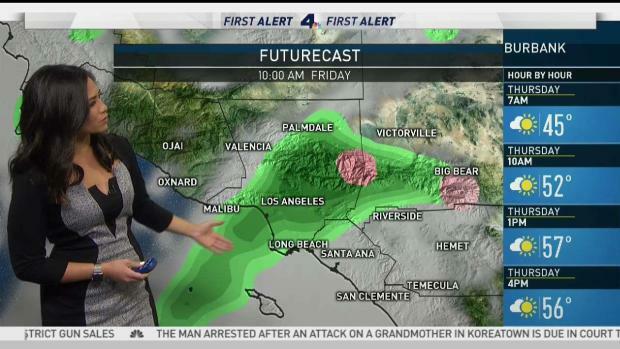 "It's been almost two months since we've seen something like this happen in Southern California," said NBC4 forecaster Shanna Mendiola. Santa Barbara County issued a mandatory evacuation order for south coast communities including Montecito, where a Jan. 9 storm triggered flash floods that destroyed or damaging hundreds of homes. 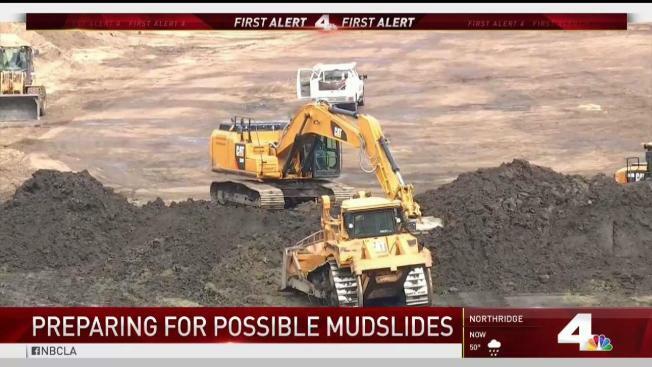 The January storm also triggered flooding and mudflows in Los Angeles County, including a Burbank neighborhood where water, trash bins, a Prius, mud and debris rushed down Country Club Drive. Burbank city officials were distributing sandbags Wednesday to residents hoping to protect their properties from flooding or mud flows from the La Tuna fire burn area. Several vehicles and homes were damaged in the January mudslide on Country Club Drive. A winter storm warning was in effect for Los Angeles and Ventura counties. Those areas also were under a flash flood watch early Thursday. The watch area includes neighborhoods near the Creek and La Tuna fire burns areas, the Los Angeles County mountains, excluding the Santa Monica Range, and the San Fernando Valley and extends into Friday afternoon. The Creek Fire, which burned more than 15,000 acres before reaching full contamination in Sylmar, weakened the soil during one of the largest storms of the season. Although no formal orders were given to Sylmar residents, officials opened the Sylmar Park Recreation Center as an evacuation site should people need it. Burn scar areas are more succeptible to flooding because fire strips the landscape of vegetation. Without vegetation on a hillside, water bounces off the surface instead of soaking into the soil. The heaviest rain is expected Thursday⁬ night through Friday morning, when rainfall rates up to a half-inch per hour are possible. In Southern California's mountains, snow accumulations of 12 inches or more are possible above 7,000 feet with accumulations of 6 to 12 inches down to 6,000 feet. Gusty south to southwest winds 25 to 35 mph with gusts up to 50 mph can be expected Thursday night through Friday evening. Along with the flood threat, the winter weather brings a good sign for the state. The system triggered a blizzard warning for parts of the Sierra Nevada, which means snowfall that's vital to the state's water supply. The Sierra Nevada snowpack is only about a quarter its normal size for this time of winter.